A Junk-Foodaholic's Journey to a Healthy Lifestyle: Weight Watchers Results Are In! Weight Watchers Results Are In! I had my weigh-in yesterday and found that I lost 4-1/2 pounds! I'm very excited about doing the Weight Watchers program. It has been extremely easy. I've been worried and intimidated about the 'counting points' thing for nothing. Since we are creatures of habit (basically eating the same things over and over again), it's easy to figure out the points, then copy the info from one day to the next. I wish I had joined Weight Watchers years ago. Happy Valentine's Day Eve! I hope you all have a wonderful weekend. Congratulations on your weight loss, that's great news! I was also a little intimidated by the whole counting points thing when I started WW, but then it got a lot easier and even turned into a habit for me. Wow - that is great! Can't wait to hear how the program works for you. Congratulations on your great results! Congratulations on a very successful week. My hair stylist lost 45 pounds on Weight Watchers. She looks great. Keep up the great work. Good for you. Keep up the great work. You lost 4.5 lbs? Fantastic! Keep up the good work. 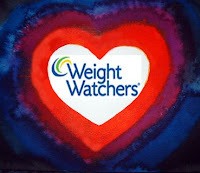 Weight-watchers is really good for those serious about losing weight and sticking to a healthy weight-loss plan. I've seen it work for several people. Happy Valentine's Day and have a good weekend, yourself. Yayyy WTG!!! That's quite an accomplishment!! Anna - Thank you! I'm really enjoying it so far. Thanks for the link to your recipe blog. I checked it out and I especially like the way you can click on the point value and see the recipes that way. Cool! Sandee - Thank you! I know several people who have lost a lot of weight doing Weight Watchers too. Mama Flo - Thank you! wish i could exchange links with you..
Congrats! A friend lost over 150 pounds on Weight Watchers so I know it works. I give people who do the whole weight loss thing with dilligent effort huge props--it's much better all the way around than stomach stapling/banding. You go girl!